Waiting on Wednesday is a weekly meme hosted by Breaking the Spine that spotlights upcoming releases that we're eagerly anticipating. I absolutely ADORED Demonglass, which is the second book in the series. 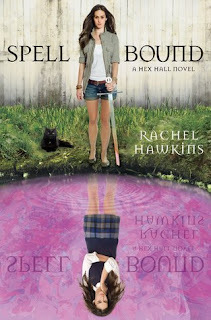 The ending left me hanging on the edge of my seat and I am so eager to read Spellbound, I can't even describe it. If you haven't read the first two books in this series...do it now. I kid you not. It is the Hex Hall series and it is fantabulous! And, I mean, look at the cover! Purrddddy. So what books are you peeing your pants for? We can't wait for this one either! I loved the first two, and am eagerly waiting for this one too! It was my WoW a few weeks ago! I'm a new follower, and I love your paw print rating system! This is one of my favorite series ever! Great pick! New follower! Great Pick! Follow me here http://wtfareyoureading.blogspot.com Following You now!